(Published in Open Democracy; co-written with David Sogge). It’s become an annual tradition. Every year, Oxfam publishes shocking statistics on inequality just days before the global elite gather at the World Economic Forum (WEF) in Davos, Switzerland – an invitation-only event that hedge fund billionaire-philanthropist George Soros once termed a “big cocktail party”. Corporate chieftains that WEF serves and celebrates undoubtedly benefit from these flows of wealth, in part because they own the machinery that ‘pumps’ it upward. So what does a typical ‘Davos Man’ think about upward redistribution? On the surface, it would seem they are worried. WEF elite surveys since 2012 have fingered “severe income disparity” as a serious source of risk both for social and political stability and for the expanded purchasing power so vital for the corporate bottom line. In these surveys of risk perception among WEF’s “communities of leaders”, attention to inequality is sometimes strong, often not. But broadly their views have come to echo recent talk at high levels in the aid-and-development world, notably in the IMF, which has also begun to send off signals that inequality is bad for economic growth. So what do they propose as a solution? WEF’s recent paper, The Inclusive Growth and Development Report 2015 gives some perspectives. While it sidesteps questions of what drives inequality, the Report does at least accept that “a geographically and ideologically diverse consensus has emerged that a new, or at least significantly improved, model of economic growth and development is required”. Would that mean consigning today’s neoliberal model, that has created the transfer of wealth upwards to history’s trash-heap? Perhaps it is not a great surprise that the answer is – no, not at all. Rather, the WEF report pooh-poohs redistribution and skilling-up policies as too narrow in scope. Instead it plumps for globalised growth and business as usual, arguing that it is important not “to miss the fuller opportunity to adapt or ‘structurally adjust’ one’s economy” to global forces as they present themselves. With the WEF, as Yogi Berra once said, it’s like déja vu all over again. Beyond the waffle, and references to popular protest about what people “perceive as a distorted and non-inclusive economic and political system”, Davos Man maintains an ironclad faith in technological innovation, entrepreneurship, and corporate-led globalisation. Moreover, rather than just seeking to sustain the existing system, WEF’s delegates are seeking to entrench it by reducing the role of nation-states in governance, and promoting corporations as new ‘global citizens’. For the WEF, national governments and political systems often get in the way of a globalised future. The solution to any crisis, such as inequality or climate change, is more collaboration and “partnerships” with corporations. For example, the WEF Global Risks Report 2015 holds that multinational companies and consumers should seek “global collaboration in the face of growing pressures to prioritize national economic self-interest”. Much of these partnerships are proposed in the shape of ‘multi-stakeholder’ platforms, thousands of which exist already addressing issues from forest management to internet name allocation. By far the most ambitious of these is a big plan for running the world, the Global Redesign Initiative. Nothing so grand has been imagined since the Bolshevik’s dream of a ‘World Socialist Soviet Republic’. Fortunately, a team at Boston University has analysed the initiative and its first blueprints. The team found that if WEF’s planetary governance system were put into motion, it would further blur the lines between corporate and governmental spheres. Multi-stakeholder governance would mean increasingly replacing legislated ‘hard law’ and policy with normative guidelines (‘soft law’) favoured by corporations. Compliance by corporations would become voluntary; enforcement through penalties, fines and jail terms would be discouraged, (except, of course, where business interests are at stake). A globally-redesigned, multi-stakeholder world is a free world, corporations can simply decline tasks if they so prefer. Multi-stakeholder governance would therefore be a hit-and-miss affair; just where buck stops, and who must account to citizens, is left vague in this frankly frightening dystopia. Multi-stakeholder governance is accompanied by a constant push for public-private partnerships (PPPs) as an answer to almost any problem of research, development and investment. At first glance, they are attractive inasmuch as they mobilize private monies where public treasuries allegedly face constraints. But the reality of PPPs going by their track records, is anything but positive for citizens, especially in the long run. A specialists’ report published by the European Union concluded in 2014: “PPPs are by far the most expensive way to fund projects. Equally important, the cost is often non-transparent and not accountable to auditors, parliaments or civil society groups. Similarly, debt sustainability assessments do not currently take account of this cost as these are treated as off-budget transactions, and PPPs have also tended to be very high risk financing”. In most cases then, we shouldn’t touch public-private partnerships with a barge pole. Meanwhile, to demonstrate their social concern, the corporations at WEF emphasise their involvement in voluntary corporate social responsibility codes. But what does CSR actually accomplish, and for whom? A comprehensive, and damning answer comes from a major three-year research programme funded by the European Commission and involving 17 European business schools and think-tanks that probed the impact of CSR as practiced by more than 5000 Europe-based firms. The study’s headline conclusion: “[T]he aggregate CSR activities of European companies in the past decade have not made a significant contribution to the achievement of the broader policy goals of the European Union”. Most CSR activities are managed by public relations departments; CSR rarely enters core corporate strategies. As the researchers see it, CSR as practiced today should be consigned to the history bin. Public laws and regulatory measures are far more important if public goals respecting job quality, the environment and the economy are to be achieved. Further discrepancies between corporate rhetoric and reality have been revealed in research coordinated in the University of Oregon’s Lundquist College of Business. The study compared the effective tax rates paid by a sample of American firms between 2002 and 2011 with a measure of those companies CSR programmes. It found that the companies which bang hardest on the CSR drum also strive the hardest to avoid paying tax. Further, companies with high CSR scores tend to spend the most on lobbying to lower their tax. In other words, most corporations use CSR as a public relations gimmick and as a substitute for taxes they should be paying. Oxfam’s own research showed that 9 out of 10 of WEF’s corporate partners are registered in tax havens. So much for corporate ‘citizenship’. Apart from having corrupted political life, the most disturbing thing about corporate pressures to lower their taxes is how overwhelmingly successful they have been. According to a 2015 study by IMF economists, corporations in richer countries are today taxed at rates approaching half of what they paid in 1980. Losses to public treasuries in rich countries have been substantial, while for poorer countries the losses have been massive – an estimated $200 billion per year, equivalent to 1.7 % of their GDPs. Under pressure from corporations, politicians have made laws (and under-funded tax offices and regulatory watchdogs) that permit corporations and individuals to channel and hide their profits and other assets in low- or no-tax secrecy jurisdictions (e.g. Switzerland, Lichtenstein) and other low-tax offshore financial centres (e.g. Delaware, Ireland, the Netherlands). 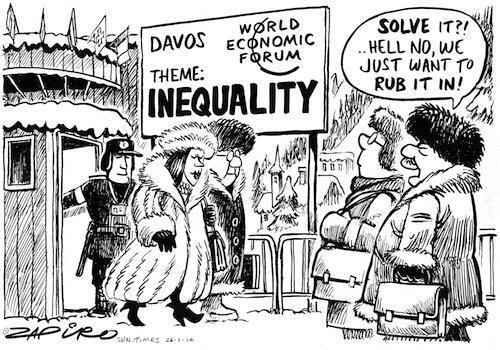 So while some have welcomed the fact that the Davos Man is talking about inequality rather than ignoring it, the fact that it is getting worse each year under their governance suggests it is rather short-sighted to believe that the World Economic Forum will ever be a place to look for solutions. Not only does Davos fail to turn its rhetoric on social responsibility into any real practice, it continues to advocate policies that will exacerbate inequality. Worse of all, they are seeking to build a system of multi-stakeholder governance that will keep power and policies under their control. Real solutions to inequality will, as they have always done, come from movements ‘from below’ demanding redistribution of wealth and power.